Speaker: Erin Schor, VP Michigan Community College Assoc. Topic: "Mayor's Arts and Culture Commission"
Nominations Wanted for our Club's "Rotary Hero"
Nominations Wanted for our Club’s “Rotary Hero” Our club’s board of directors is requesting nominations for a club member who will be recognized as our club’s “Rotary Hero.” The Rotary Hero will be selected by our club’s board at our February 19th meeting, and will be honored at the District Conference held on Mackinac Island in May. A nominee should be a current Rotarian who truly exemplifies “Service Above Self” in everything that he or she thinks, says or does, or a long-time member who has given many years of service. The deadline for submission of nominations is February 12th. All submissions should be emailed to Cathy at Cathy@lansingrotary.com. If you have any questions please direct them to President Dennis Fliehman. Attending the May District Conference? Attending May District Conference? If you are planning to (or even thinking about) attending the District Conference at the Mission Point Resort on Mackinac Island May 16-19, would you please let Cathy know? We are trying to determine who might be able to represent the club at the annual dinner. Thank you! Linda E. Dansby, 82, passed away peacefully on Sunday, Feb. 3, 2019 in Lansing, Mich. upon a kiss from her devoted husband of 62 years, William (Bill) Dansby, while holding the hands of daughters, Melanie Natarajan and Angela Dansby. She was born June 28, 1936 in Jacksonville, Fla. to Wilmer and Sinah (Moore) Shiver. After marrying Bill, the two spent several years in northern Florida before moving to East Lansing, Mich., where they raised their daughters. Linda worked at Michigan State University as an administrative assistant first for a professor, then for the College of Human Medicine before retiring in 2005. Linda was an active member of the Lansing community, involved with the Junior League of Lansing, Kresge Art Museum, HELO Club, Wharton Center Inner Circle and White Hills Book Club among other organizations. She was an avid gardener, talented pianist, memorable entertainer, supporter of the arts and proponent of all things beautiful. Affectionately known as “Mrs. Manners” and the “Hostess with the Mo-stess,” Linda was the epitome of grace and class. She was known for her beauty, Southern hospitality, kindness, sensitivity, inclusiveness, enthusiasm, energy and fashion. Her family-oriented values touched the lives of many. Visitation will be Wednesday, Feb. 6 from 4 to 7 pm at Gorsline Runciman Funeral Homes, East Chapel, 1730 E. Grand River Ave., East Lansing. A memorial service will be held Thursday, Feb. 7 at 11 am at The Peoples Church, 200 W. Grand River Ave., East Lansing. The family will receive friends one hour prior to the service. Linda’s burial will be at Sarasota National Cemetery followed by a celebration of her life. Memorial contributions in her honor may be made to the Junior League of Lansing Endowment Fund or The Peoples Church in East Lansing. Online condolences may be expressed at www.greastlansing.com. The South Lansing/Holt Rotary Club will be hosting their 15th Texas Roadhouse Celebrity Server Lunch on February 28nd. Tickets are $20.00 each, you have a choice of chicken, or steak, salad, rolls, and soda, coffee or tea. ALL income from event will go to the Rotary scholarship, which provides money for seniors from Holt, Lansing Everett, .we have donated over $225,000.00 to the scholarship program over the past 15 years...due to Texas Roadhouse donating all the food, and they pay their staff to help us. nosoff@aol.com Thank you for the support! The Haslett-Okemos Rotary Foundation Hero Luncheon will be held on February 12, 2019 at Ukai Hibachi Grill, 2314 Woodlake Dr., Okemos. This annual fund raiser supports scholarships for graduating seniors at Haslett and Okemos high schools, including vocational scholarships for a student at each school pursuing career training after graduation. Funds also support other special needs as identified by administrators at each school to address barriers to full participation such as transportation, clothing, and extra-curricular activities. Tickets are $25, with seatings at 11:45 am and 12:30 pm. For tax purposes, $15/ticket is a charitable contribution. If you are interested in attending, please contact our Assistant District Governor, Tammy Lemmer, at 517-648-0689. With the infamous Polar Vortex a not so distant memory, Lansing Rotary provided an opportunity to return to some semblance of normalcy. Yes, after two days of hunkering down for the majority of not only mid-Michigan, but the entire Midwest, President Dennis Fliehman called the meeting of the Lansing Rotary Club to order precisely as the clock struck 12:30. Our invocation was delivered by Sue Mills followed by a singing of our patriotic song, the Star-Spangled Banner. 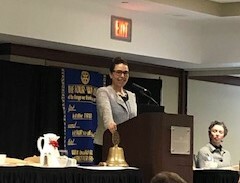 Visiting guests and Rotarians were introduced as Lisa Smith gracefully traversed the meeting room to deliver our Rotary microphone and Diane Sanborn shared that Rotarian Bill Dansby’s wife, Linda, was not doing well. She asked that we all keep Bill and Linda in our prayers. Diane then delivered a Rotary Flag from her recent visit to Japan to President Dennis. Dennis reminded Lansing Rotarians that we continue to seek nominations for our Lansing Rotary Hero. Suggestions are due by February 12. This gives us an opportunity to honor and recognize one of our own who exemplifies ‘service above self’. The District Conference in May will be on Mackinaw Island. If you plan to attend, please let either Dennis or Cathy know. Ken Beachler next introduced our special music of the day, and once again….it was special, but before he got to his introduction, he let us know that our own Hari Kern would be doing a lecture recital at the FRIB. For our special music of the day, our own ‘cultural treasure’ Rodney Lamar Page was introduced to share his talent on the violin with us once again. Ken also shared that on February 10, Rodney and his two sons will be performing at 2pm at the East Lansing Public Library in a free concert. Then we were able to sit back for a few special moments as Rodney and the violin became one. Often looking like he was in a trance as he performed, the music coming from his violin captured all of us. Providing a wonderful explanation of the range of emotions from his first piece, he left us in laughter as he shared he would be leaving the Lansing Center after his second piece to immediately head to West Bloomfield to perform at a pajama all-nighter event. Thanks to Ken and John Dale once again for delivering such wonderful and talented entertainment to our club! Our Chair of the Day, Courtney Millbrook than introduced our speaker. Providing Statewide knowledge and work on arts and culture, as well as serving her 4th term as chair of the East Lansing Arts Council, stepping in as the new chair of Junior League of Lansing, and serving on the Mayor’s Arts and Culture Commission in Lansing, Sarah Triplett, Director of Public Policy and Advocacy for Creative Many Michigan stepped forth to tell us about this organization and the history, challenges and future opportunities for the arts in our community and state. Sarah began by reminding us that her husband, Nathan, an East Lansing Rotarian and former Mayor of East Lansing, is the District Governor Nominee, but for today, he was the Dad to the rescue as their son was ill. Yes, that is exactly what Rotarians do! Creative Many Michigan is a statewide organization created to support the creative sector in our state. Working with artists and creative practitioners, this organization works to identify the issues and barriers to entry as a voice for this important component of our society. Training, business issues, copyrights, advocacy and much more is the focus for what we learned from Sarah, is an economic powerhouse, representing 4.2% of GDP. A nearly $18 billion industry, the arts and creative component of our society is a huge economic engine providing much return to society in a number of ways including employment and entertainment through a variety of not-for-profit organizations. With all of this importance and promise, though, Sarah shared that the funding to the arts has been cut in some areas by nearly 90% since the beginning of 2000. Both national and statewide support continue to be down dramatically. Similarly, during this time period, funding to schools for arts and culture education has been reduced dramatically…and not restored. This need now falls to not-for-profits to fill this void. Sarah gave a special shout out to our own Barb Whitney for the work that Barb has brought to this community to provide both education and opportunities to students across our region. Sarah then responded to questions from Lansing Rotarians. In closing, I have to comment that as I looked at the podium for our meeting, seeing Courtney, Barb and Sarah together, it was obvious to me that these three women are working to move the arts and cultural activities in our community to the level that we all want and need for ourselves and our children. How fortunate we are to have this talent among us. As the meeting concluded, President Dennis thanked our speaker, giving her a Rotary Coin with the 3-way test (thanks to a last minute save by our own Cathy!). In lieu of a speaker’s gift, Sarah was told that we will make a donation to our Bio Sand Filter water project to provide pure water to developing communities in the Dominican Republic. Next week’s meeting will be at the Country Club of Lansing where we will be provided a New Member Presentation. This is a change from previous plans. President Dennis adjourned the meeting early and Lansing Rotarians headed out to once again, make a difference in so many ways.